Pratic launches the new press campaign and adopts an innovative language for the outdoor market: the black and white visual refers to the minimal design of the products and transmits glamour and refinement. The light verticality has been treated in the recent neuro-scientific research, Healthy Lighting, with the contribution of the Universities of Milan, Reggio Emilia and Modena. It seems that the vertical light transmits a sense of relax and concentration. 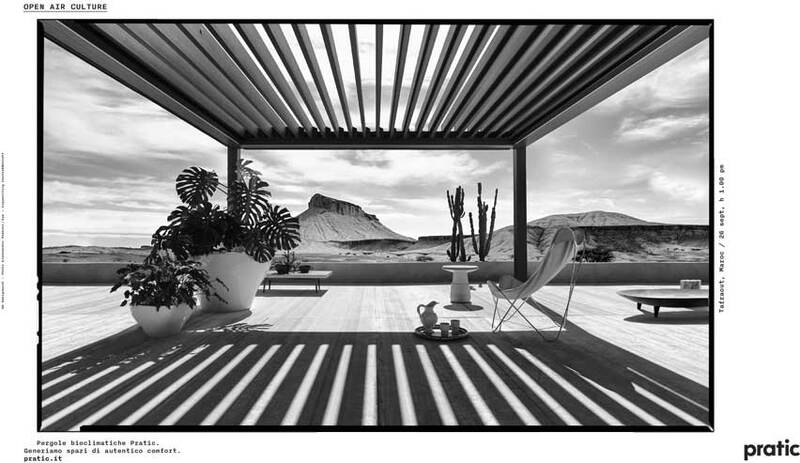 The suggestive landscape of Maroc suggests that the Pratic pergolas are perfect in every architectural and natural context. We create spaces of authentic comfort. This is the concept of the campaign well expressed by the Pratic products, that stand out for the care of the details, the constant technological innovation, the high quality of the materials and the made in Italy design. Open air culture is the company philosophy: reflections about the time that we can live outside . In fact Pratic creates unexpected scenarios of light and shadow, enlarging the spaces and people minds. From March to December Pratic will be present on the main magazines of design and the most important Italian newspapers.